The Orangutan Care Centre and Quarantine (OCCQ) facility was established in 1998, by Dr Birute Galdikas, founder of the Orangutan Foundation International (OFI), and the famous Camp Leakey in the Tanjung Puting National Park. The Centre was initially designed to accommodate less than 100 orangutans who were confiscated from private individuals or rescued from palm oil plantations. 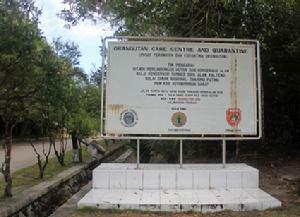 However, due to the devastating forest fires of 1996/97, the Centre was soon flooded with many more orphans than they had anticipated. It is a sad fact that over the past years, the numbers have continued to grow and the Centre now cares for more than 330 orphans, ranging in age from under a year to 15 years. The orangutans get excellent medical care from the permanently employed vets, and are encouraged on their way to be rehabilitated for the wild by the more than 150 local staff at the Centre. It is here, that I have been privileged to spend a month in 2008, 2010,2011 and 2013 helping out at the nursery pondok, caring for some 30 infant orangutans. These life-changing experiences working with such amazing creatures, were instrumental in my setting up Orangutan Aid in Hong Kong in order to try and do something to help. Naturally the Centre is very close to my heart and is therefore the focus of our first project. As you can imagine, the monthly running costs for the Centre are huge and OFI receives no government funding or large grants to help with the operating costs. They rely solely on donations and their own fundraising efforts. Not only do they need funds just to keep operating, but funds are needed to be able to adequately house the increasing numbers of Orangutans. 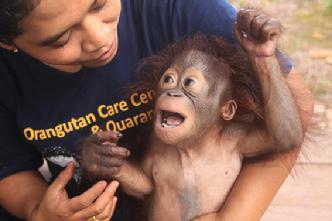 In 2010, Orangutan Aid was able to donate a small amount of money to be used at the nursery pondok (see blog "How your donations were spent") and also put money towards building a new enclosure for Hocky, one of the disabled young orangutans. Each year we have been able to increase the amounts donated and we continue to support OFI in helping to improve conditions for the orangutans at the centre. This is an ongoing project. 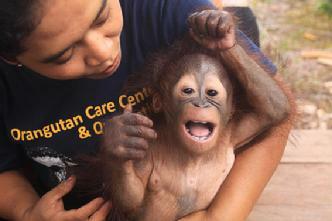 The greatest danger facing orangutans in the wild is the loss of their habitat due to deforestation. 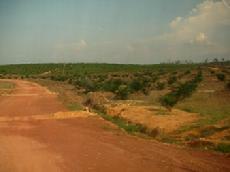 Millions of hectares of virgin rainforest in Borneo and Sumatra, are being destroyed to make way for palm oil plantations. This is disasterous for the survival of the few remaining orangutan populations, and puts ever-increasing pressure on the existing rehabilitation and care centres, as more and more orphaned and displaced orangutans are brought to them. These centres are now faced with a huge problem - where to find suitable, protected forest where those already rehabilitated orangutans can be returned to the wild. One of the ways forward, is for responsible organisations to purchase forested land which they will be able to protect for future years, when the current infants they are caring for will be ready to be released back into the forest. The Orangutan Foundation International (OFI) set themselves a goal to purchase a 640 000 acre piece of forest near the Care Centre, called the Rawa Kuno Legacy forest in Pangkalanbun, Central Kalimantan. 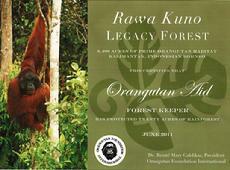 Over the years Orangutan Aid has donated to towards this project and helped OFI to achieve their goal. 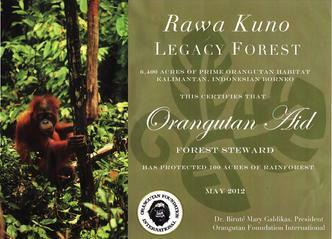 These certificates from the Orangutan Foundation International, represent our donations towards the purchase of land in the Rawa Kuno Forest Legacy. We are delighted to have been able to contribute towards the successful acquisition of this forest. OFI's continues to purchase parcels of land especially those still with intact forest wherever possible, with the aim of linking them with "safe corridors" for the orangutans. Much of the land they own is surrounded by palm oil plantations and therefore guard posts and constant surveillance is necessary. 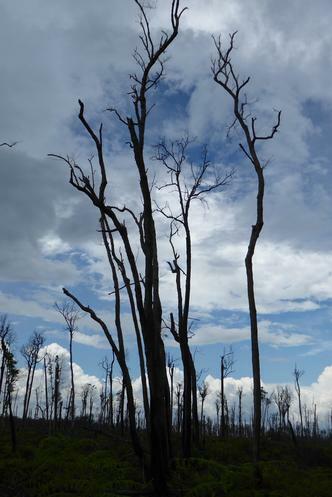 In 2015, the year of the worst fire outbreak sice 1997, thousands of hecatres of forest, including part of the Rawa Kuno forest were destroyed. 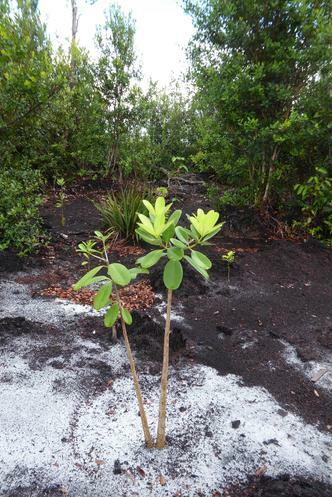 This heartbreaking occurrence has motivated OFI to launch a reforestation project. They have etablished a nursery and painstakingly cultivated thousands of seedlings, with the first batch being planted in early 2017. It will be at least 10 years before the forest becomes viable so this is an ongoing and long term project with reforestation planned in other areas too. It is gratifying to watch the progress made so far and we applaud and support their hard work.